For the third year in a row the club has assembled a great display of wood turnings at the Arts & Crafts exhibition at the Delaware state fair. The Delaware State Fair in Harrington, Delaware is running from July 19 to 28th. Take time to go look at the display and see the great turned items. 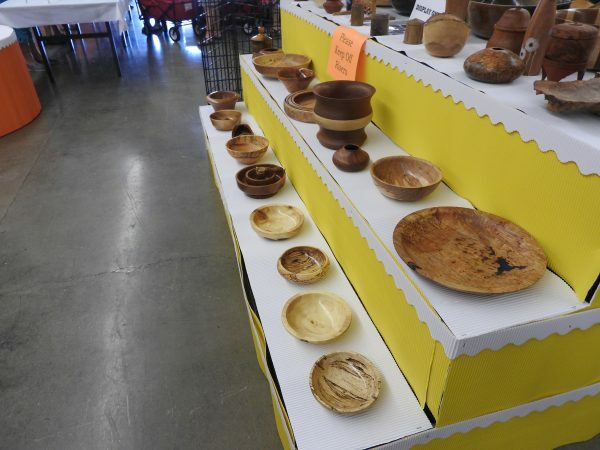 In the spirit of competition, seven club members entered a variety of turned and other items in a multitude of categories to be judged. The items for judging are outside the display area and are worth looking at while you are there. Good luck to those who entered items for judging. A huge thanks to all the folks who contributed turned work for this year’s display: Dennis Dow, Ross Kendall, Don Cave, David Beehler, Mike Adams, Ron Wilson, Mike Okner, John Bacino, Don Surles, Don Povinko, Steve Childers, Eric Krum, Jeff Turi, Mark Addison, and Kim Palmer. 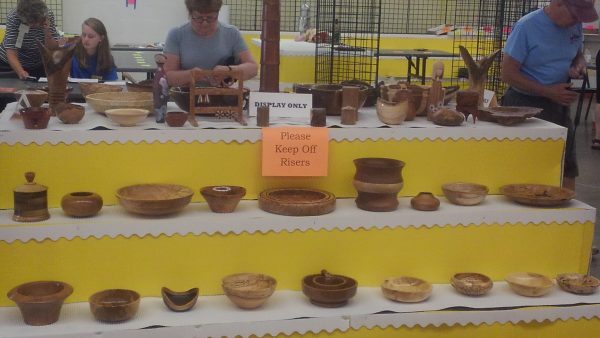 Thanks again for the great effort to once again show our woodturning to the visitors at the Delaware State Fair and to let people know there is an active woodturning club in the area. Also thanks to the crew who helped with the set up on Saturday, July 14th: John Bacino, Eric Krum, Mike Okner, and Marge Sloan. It took the team about 1-1/2 hours to set up the display in the Dover building at the fairgrounds. The First State Woodturners display is in the center of the building near the entry doors at the Grand Stand end of the building. While you are there, be sure to make time to see the sights and many activities at the fair.